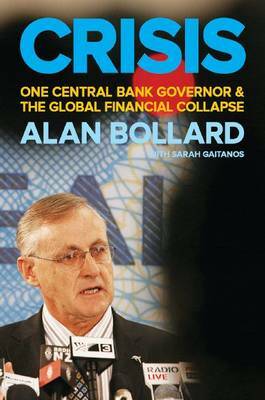 ‘Now we have a brilliant biography by Sarah Gaitanos, who has put together in a highly readable way a mass of material …’ – Roger Hall, Listener, 20 January 2007. 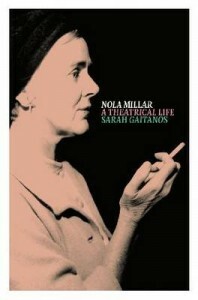 ‘Gaitanos has dug deep and rewardingly and by so doing not only done Nola Millar proud. Her meticulous account of the theatrical life and times of Wellington, particularly from the 1930s through to the early 70s, viewed through the prism of Millar’s emergence as persistent, unflagging theatre director and teacher, is social history at its best.’ – Michael Nicolaidi, New Zealand Books, Summer 2007. ‘… Sarah Gaitanos’s excellent biography … thoroughly researched and extremely well written, paints a vivid picture of a woman who has long been overdue such recognition.’ – Lisa Warrington, Australasian Drama Studies, October 2007. ‘The historical scholarship is superb … deserves to be on the shelves of libraries throughout the country … an excellent in-depth social history on the development of New Zealand theatre …’ – Dan Dorner, The New Zealand Library & Information Management Journal, April 2007. ‘… an intriguing view of Wellington artistic and intellectual life from the 1930s to the 1970s and a candid yet affectionate examination of a unique soul.’ – Colin McColl, Dominion Post, 13 January 2007. ‘I admire the rigour of her research in painstakingly scouring a broad range of sources to build a picture of this woman who worked tirelessly for theatre but didn’t advertise the fact. And she is successful in this. Rather than letting the wall Millar built around herself prevent us from understanding her, Gaitanos creates a great deal of empathy for the quirky-looking woman with a love of the horses. She demonstrates the human frailty of a loner, whose closest friends didn’t really know her, by the narration of simple events … Gaitanos’s writing clearly elucidates this wonderful character …’ – Bronwyn Tweddle, Illusions 39, 2007. ‘[Nola Millar was] one of the most influential characters of our creative history. 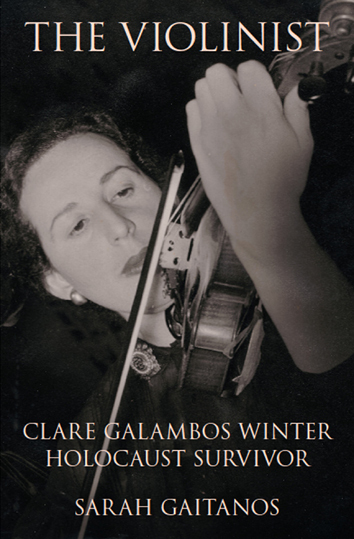 Sarah Gaitanos has delivered an immensely readable biography of a unique woman.’ – Margaret Christensen, Wairarapa Times Age, 6 December 2006. ‘… this book is endlessly inspiring creatively …’ – David O’Donnell, Senior Lecturer, School of English Film Theatre and Media Studies, Victoria University of Wellington, ‘Academic Idol: Round Six’, (favourite book) Salient, 6 September 2010. 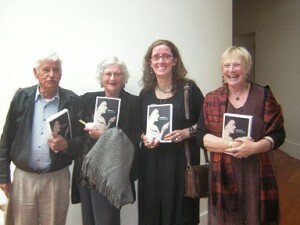 Four directors of Toi Whakaari: George Webby, Sunny Amey, Robin Payne and Annie Ruth, at the launch of Nola Millar: A Theatrical Life, October 2006. 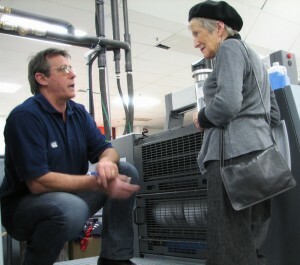 Since Nola Millar was printed locally at Printlink in Petone, I was there at the birth. ... So was my editor, Delyse Kitteridge, checking. 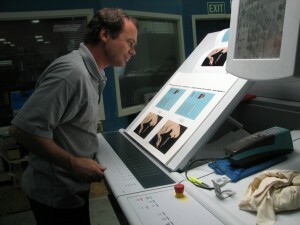 This machinery also played a vital role - I can't remember what!